On-board temperature correction using the latest ICUMSA tables. The J47 was designed to meet the unique needs of a food and beverage testing where the samples are mostly a mixture of sugar and water and the refractometer is viewed more as a tool than a laboratory instrument. The J47’s single flat measurement surface, temperature correction and one button measurement capability make it perfect for heavy use applications. 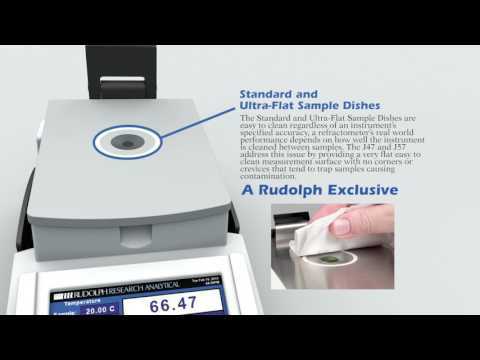 The Rudolph J47 features a fully automatic measuring system. The operator simply places the sample on the prism, presses a button and the result is displayed on a 7.5cm x 10cm back lit LCD. There are no shadow lines to match and there is no eyepiece requiring operator determination or manual adjustment. All functions of the J47 Automatic Refractometers are activated through a large 4.3″ 480dpi, digital, color TFT LCD touch screen. The 70mm X 75mm measure button on the J47 is designed to allow an operator wearing gloves to activate measurement with an elbow or side of a hand. The sealed touchscreen is resistant to fingernails, sharp objects, chemicals and acids. The Rudolph J47 refractometer corrects for errors caused by sample temperature variation using the latest ICUMSA temperature correction tables. Temperature correction is a very fast mathematical solution to obtaining measurement results without a temperature control system or a water bath. These measurement results are the most accurate when samples are comprised of predominantly sugar and water. The J47HA was designed for the food and beverage industries with a BRIX range of 0 – 100% and a Refractive Index range of 1.32-1.53. The J47HA offers an accuracy of ±0.03 BRIX and ±0.00003 Refractive Index. The J47 is the temperature corrected but not temperature controlled model of the Rudolph range. It offers most of the same features as our more expensive models but lacks the built in Peltier heating and cooling system for samples requiring temperature control. 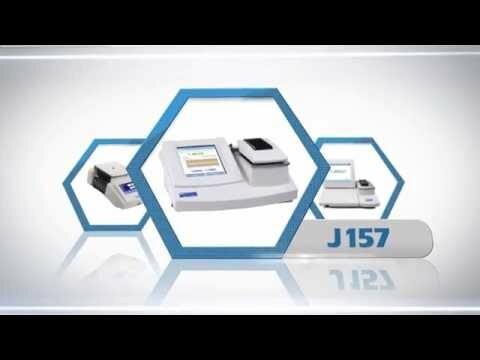 The J47 is a true simplified laboratory instrument rather than a digital hand refractometer pushed beyond limits. Regardless of an instrument’s specified accuracy, a refractometer’s real world performance depends on how well the instrument is cleaned between samples. The J47 addresses this issue by providing a very flat easy to clean measurement surface with no corners or crevices that tend to trap samples causing contamination. When a traditional manual Abbe refractometer is used in a high throughput application prism replacement becomes a regular task. This is because traditional Abbe refractometers have glass prisms which are much softer than the sapphire prism of the J Series and thus more prone to scratching and general wear and tear as described below. The traditional method of measuring Brix in a laboratory was a Abbe refractometer, sometimes with a water bath attached, sometimes not. (An Abbe with a water bath is the functional equivalent to the J57. An Abbe without the water bath is the functional equivalent to the J47). The cost of replacing the Abbe’s dual glass prisms over time makes owning a J47 with its single sapphire prism actually less expensive than owning an Abbe over their comparable useful lives. The J47 offers a 1 or 2 point user calibration. The instrument stores the calibration information in line with ISO and similar standards. The calibration system is password protected enabling an administrator to control who can calibrate the instrument. Versatile instruments have advantages when applications change. However, versatility can sometimes lead to confusion by forcing operators to interpret extra results that may have no relevance. The J Series customizable display allows the instrument to be configured to exactly what is required for each application. The customizable keypad can be “locked out” or just a few keys can be operable, making for an even faster learning curve. The lockout function, calibration and other functions are all password protected. You are tired of arguments over shadow-line interpretation on your Abbe Refractometer. One person says the material is on specification, one person says it’s not. In addition, scratches on the glass prism make visual interpretation even more difficult. J-Series Internal Reflection Refractometers use scratch proof artificial sapphire prisms that measure the reflected light not the transmitted light, like the Abbe, so dark samples measure as easily as clear samples. Just put a drop of sample on the prism, press measure and walk away. No shadow line, no manual balancing or interpretation. In today’s highly regulated environment many users find hard copy or computer record keeping essential. The J47 comes complete with an RS232 port and a forward facing USB port. Using water or NIST traceable fluids. Factory Default calibration can always be reset. L: 12" W: 6" H: 5" / 7.8 lbs. L: 17" W: 12" H: 13" / 11.8 lbs. The refractometer is easy to use and easy to clean. We are looking forward to many years of trouble free operation.